Time to buckle down and submit another set of queries. Since my work week is now unpredictable and busy, I think Sunday will be the day to sit down and write and query. I’m looking forward to trying to find the schedule I’ll need to be a productive writer and member of the Corporate World. Any suggestions on how you all have found the balance would be great! Also, has anyone heard or using a My Trending Stories site? I received an email inquiry from them the other day but I’m slightly skeptical. I was searching for a good quote for today, there’s only a little time to spare before Monday is no more for me in my time zone, and my brain was vetoing all of the lovely, peppy and spritely quotes. I feel slightly unmotivated about writing and it can be hard to pep yourself up. The logical thinking side of my brain, which has been on ice since I left the corporate world, has been thawing out and creeping up to dominate over the creative side. I fear it will take me another 4 years to write a book, piece by piece, late at night with only Sara Bareilles to fuel me. And I can’t let that happen, not the Sara part, she’s always welcome, but the 4 year part. I’ve started journaling again in hopes it will jump start a little creative writing and picked up a few writing podcasts to listen to during my commute. 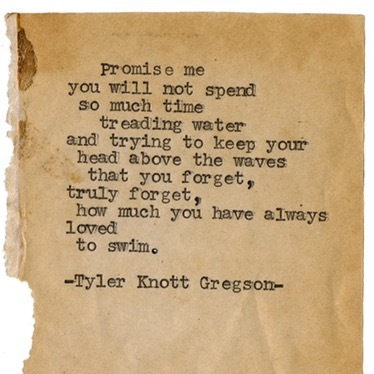 As I scrolled infinitely through quotes and searched for different ideas, tumblr notified me of Tyler Knott Gregson’s latest post. If you’re not following his website or Instagram or know of him, check him out. He runs an awesome Write Yourself Alive class and is an amazing writer and photographer. The post he shared really resonated and I found the motivation I was searching for all of a sudden. Balancing everything will be hard at first but I can’t lose sight of what I truly love and the goals I’ve set for myself and my journey. I need to remember to swim. I’ve finally made the decision to go with querying an agent first, rather than trying to submit straight for publication or going down the self-publication route. I am not an expert in publication so it’s best to leave this job to the experts, granted that’s if I can manage to land an agent. I have a positive outlook on the process, it’s something new to learn and experience and I’m sure it’ll teach me a lot. However, I also am bracing for the dreaded rejection letter. I thought this Peanuts cartoon summed up my outlook on the future. If people ask what this is like, I would equate it to submitting your resume, as a kid straight out of college, for a big time job. You have to sell yourself, sum up your life experience, or in this case a synopsis of your book, and convince the person reading your letter you’re worthy of their time and consideration. So fingers crossed, let the querying begin.